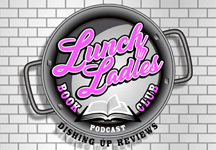 Lunch Ladies Book Club member Shelly Rosamilia flies solo again this week, reviewing Whiskey Devil by Brandon Zenner. Did she like it? What did she rate it in spatulas?